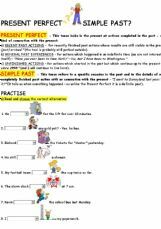 Present Simple and Plural Activities./Grammar Online Test I hope you will like teaching these grammar topics with my online exercises. Have fun! 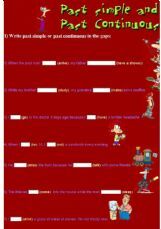 Some exercises to revise the verb to be in the three forms: affirmative, negative and interrogative. 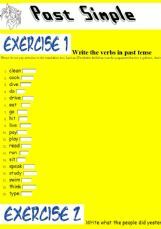 This material consists of 2 exercises and provides 59 examples of Past Simple to practice. There are two types of exercises: multiple choice and gap-filling. 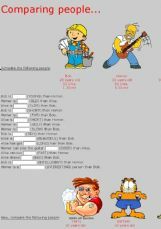 In the first one, students choose the right option to build affirmative and negative sentences in the present continuous/ look at the pictures and fill in the gaps with the present continuous. 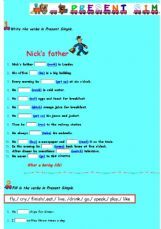 In the second exercise, there are 24 sentences students have to complete with the present continuous or the present simple. 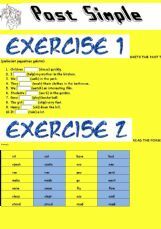 Three graded exercises to practise the difference between these two tenses - a) multiple choice; b) completing sentences; c) verb search + table filling. 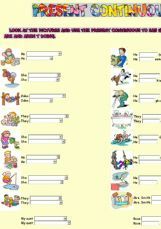 Some basic usage rules are supplied for students to check the difference in use. Hope you can use it with your students. 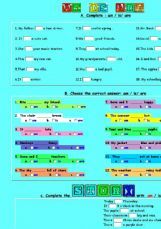 Students fill in the gaps with the information provided. Hope you like it! 6 exercises to practice Past Simple. Well....this is my small contribution to the PAST SIMPLE and PAST CONTINUOUS. I hope you like it. I will use it on Monday!!!!!!!! 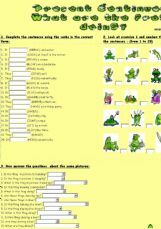 Present Continuous- What are the frogs doing?